The Boeing 757 is a mid-size, narrow-body twin-engine jet airliner that was designed and built by Boeing Commercial Airplanes. It is the manufacturer's largest single-aisle passenger aircraft and was produced from 1981 to 2004. The twinjet has a two-crew member glass cockpit, turbofan engines of sufficient power to allow takeoffs from relatively short runways and higher altitudes, a conventional tail and, for reduced aerodynamic drag, a supercritical wing design. Intended to replace the smaller three-engine 727 on short and medium routes, the 757 can carry 200 to 295 passengers for a maximum of 3,150 to 4,100 nautical miles (5,830 to 7,590 km), depending on variant. 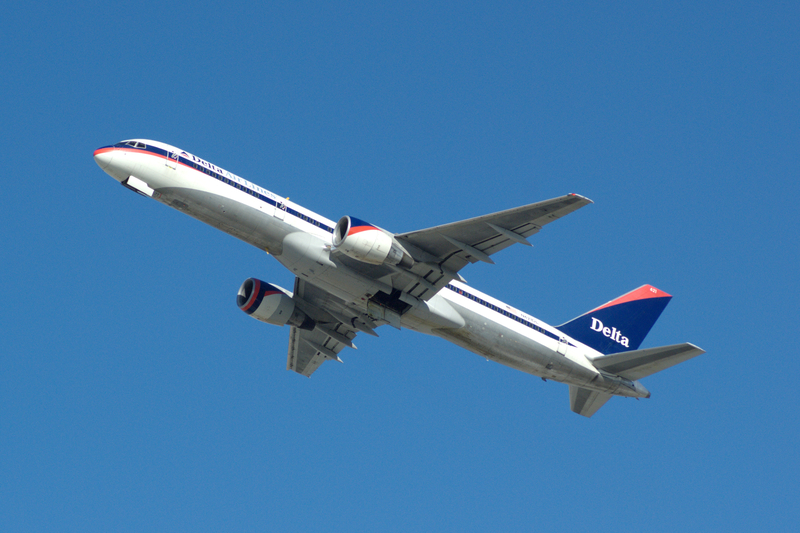 The 757 was designed concurrently with a wide-body twinjet, the 767, and owing to shared features pilots can obtain a common type rating that allows them to operate both aircraft. The 757 was produced in two fuselage lengths. The original 757-200 entered service in 1983; the 757-200PF, a package freighter (PF) variant, and the 757-200M, a passenger-freighter combi model, debuted in the late 1980s. The stretched 757-300, the longest narrow-body twinjet ever produced, began service in 1999. Passenger 757-200s have been modified to special freighter (SF) specification for cargo use, while military derivatives include the C-32 transport, VIP carriers, and other multi-purpose aircraft. Private and government operators have also customized the 757 for research and transport roles. All 757s are powered by Rolls-Royce RB211 or Pratt & Whitney PW2000 series turbofans. Eastern Air Lines and British Airways placed the 757 in commercial service in 1983. The narrow-body twinjet succeeded earlier single-aisle airliners, and became commonly used for short and mid-range domestic routes, shuttle services, and transcontinental U.S. flights. After regulators granted approval for extended flights over water (ETOPS) in 1986, airlines also began using the aircraft for intercontinental routes. 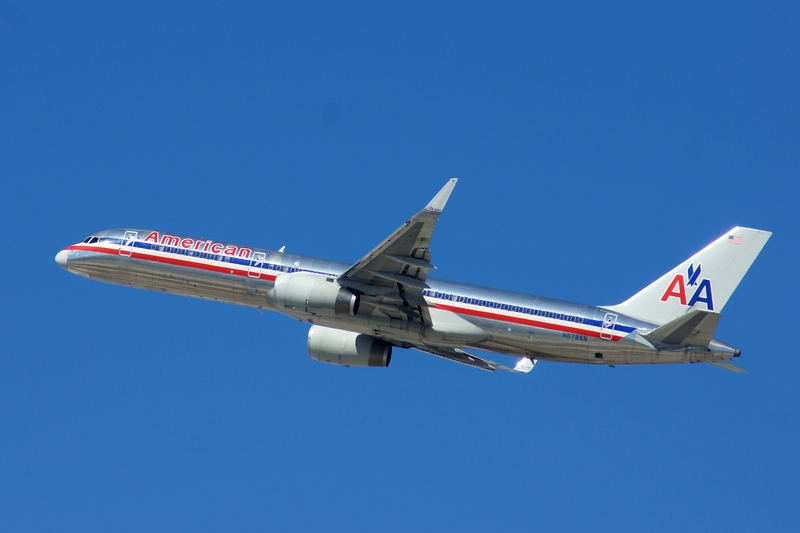 Major customers for the 757 included U.S. mainline carriers, European charter airlines, and cargo companies. The airliner has recorded eight hull-loss accidents, including seven fatal crashes, as of September 2015. Production of the 757 ended in October 2004, after 1,050 had been built for 54 customers. 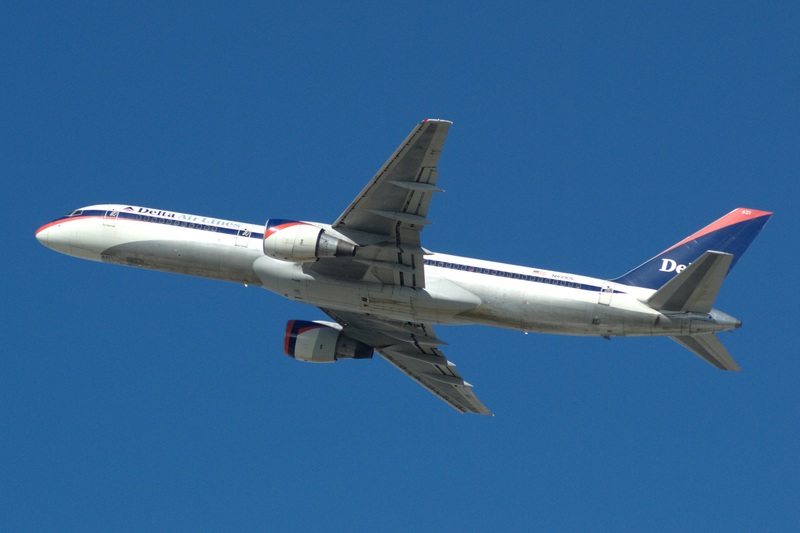 The 757-200 was by far the most popular model, with 913 built. Diminished sales amid an airline industry trend toward smaller jetliners led Boeing to end production without a direct replacement, in favor of the 737 family. The last 757 was delivered to Shanghai Airlines in November 2005. 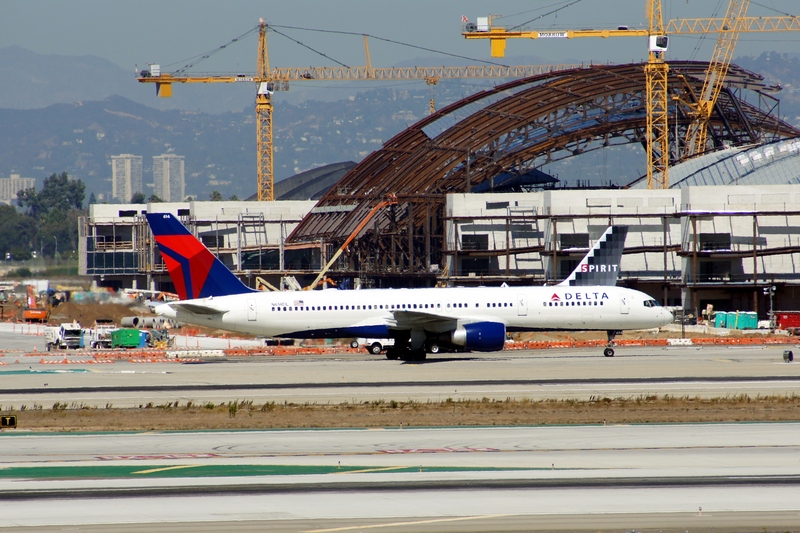 In July 2015, 738 of the narrow-body twinjets were in airline service; Delta Air Lines is the largest operator with 138 aircraft. In the early 1970s, following the launch of the wide-body 747, Boeing began considering further developments of its narrow-body 727 trijet. Designed for short and medium length routes, the three-engined 727 was the best-selling commercial jetliner of the 1960s and a mainstay of the U.S. domestic airline market. Studies focused on improving the 189-seat 727-200, the most successful 727 variant. Two approaches were considered: a stretched 727-300, and an all-new aircraft code-named 7N7. The former was a cheaper derivative using the 727's existing technology and tail-mounted engine configuration, while the latter was a twin-engine aircraft which made use of new materials and improvements to propulsion technology which had become available in the civil aerospace industry. United Airlines provided input for the proposed 727-300, which Boeing was poised to launch in late 1975, but lost interest after examining development studies for the 7N7. Although the 727-300 was offered to Braniff International Airways and other carriers, customer interest remained insufficient for further development. Instead, airlines were drawn to the high-bypass-ratio turbofan engines, new flight deck technologies, lower weight, improved aerodynamics, and reduced operating cost promised by the 7N7. These features were also included in a parallel development effort for a new mid-size wide-body airliner, code-named 7X7, which became the 767. Work on both proposals accelerated as a result of the airline industry upturn in the late 1970s. By 1978, development studies focused on two variants: a 7N7-100 with seating for 160, and a 7N7-200 with room for over 180 seats. New features included a redesigned wing, under-wing engines, and lighter materials, while the forward fuselage, cockpit layout, and T-tail configuration were retained from the 727. Boeing planned for the aircraft to offer the lowest fuel burn per passenger-kilometer of any narrow-body airliner. On August 31, 1978, Eastern Air Lines and British Airways became the first carriers to publicly commit to the 7N7 when they announced launch orders totaling 40 aircraft for the 7N7-200 version. These orders were signed in March 1979, when Boeing officially designated the aircraft as the 757. The shorter 757-100 did not receive any orders and was dropped; 737s later fulfilled its envisioned role. The 757 was intended to be more capable and more efficient than the preceding 727. The focus on fuel efficiency reflected airline concerns over operating costs, which had grown amid rising oil prices during the Yom Kippur War of 1973. Design targets included a 20 percent reduction in fuel consumption from new engines, plus an additional 10 percent from aerodynamic improvements, versus preceding aircraft. Lighter materials and new wings were also expected to improve efficiency. The maximum take-off weight (MTOW) was set at 220,000 pounds (99,800 kg), which was 10,000 pounds (4,540 kg) more than the 727. 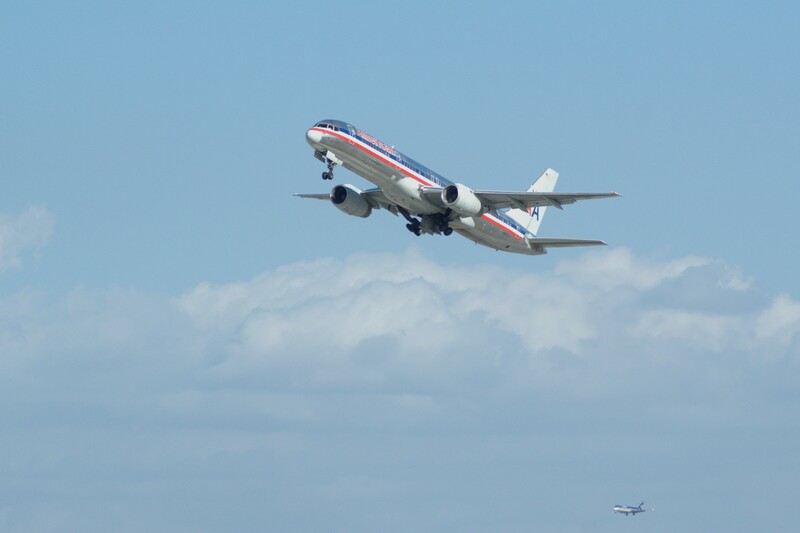 The 757's higher power-to-weight ratio allowed it to take off from short runways and serve airports in hot and high climates, offering better takeoff performance than that offered by competing aircraft. Competitors needed longer takeoff runs at airports at higher elevations, with higher ambient temperatures and thinner air. Boeing also offered options for higher payload capability. The twin-engine configuration was chosen for greater fuel efficiency versus three-engine and four-engine designs. Launch customers Eastern Air Lines and British Airways selected the RB211-535C turbofan built by Rolls-Royce, which was capable of 37,400 pounds-force (166 kN) of thrust. This marked the first time that a Boeing airliner was launched with engines produced outside the U.S. Domestic manufacturer Pratt & Whitney subsequently offered the 38,200 pounds-force (170 kN) thrust PW2037, which Delta Air Lines launched with an order for 60 aircraft in November 1980. General Electric also offered its CF6-32 engine early in the program, but eventually abandoned its involvement due to insufficient demand. As development progressed, the 757 increasingly departed from its 727 origins and adopted elements from the 767, which was several months ahead in development. To reduce risk and cost, Boeing combined design work on both twinjets, resulting in shared features such as interior fittings and handling characteristics. Computer-aided design, first applied on the 767, was used for over one-third of the 757's design drawings. In early 1979, a common two-crew member glass cockpit was adopted for the two aircraft, including shared instrumentation, avionics, and flight management systems. Cathode-ray tube (CRT) color displays replaced conventional electromechanical instruments, with increased automation eliminating the flight engineer position common to three-person cockpits. After completing a short conversion course, pilots rated on the 757 could be qualified to fly the 767 and vice versa, owing to their design similarities. A new aft-loaded shape which produced lift across most of the upper wing surface, instead of a narrow band as in previous airfoil designs, was used for the 757's wings. The more efficient wings had less drag and greater fuel capacity, and were similar in configuration to those on the 767. A wider wingspan than the 727's produced less lift-induced drag, while larger wing roots increased undercarriage storage space and provided room for future stretched versions of the aircraft. One of the last 727 vestiges, the T-tail, was dropped in mid-1979 in favor of a conventional tail. This avoided the risk of an aerodynamic condition known as a deep stall, and allowed for more passengers to be carried in a less tapered rear fuselage. At 155.3 feet (47.3 m) in length, the 757-200 was 2.1 feet (0.640 m) longer than the 727-200, and with a greater proportion of its internal volume devoted to cabin space, seating was available for 239 passengers, or 50 more than its predecessor. The fuselage cross-section, whose upper lobe was common to the 707 and 737, was the only major structural feature to be retained from the 727. This was mainly to reduce drag, and while a wider fuselage had been considered, Boeing's market research found low cargo capacity needs and reduced passenger preference for wide-body aircraft on short-haul routes. Boeing built a final assembly line in Washington at its Renton factory, home of 707, 727, and 737 production, to produce the 757. Early in the development program, Boeing, British Airways, and Rolls-Royce unsuccessfully lobbied the British aircraft industry to manufacture 757 wings. Ultimately, about half of the aircraft's components, including the wings, nose section, and empennage, were produced in-house at Boeing facilities, and the remainder subcontracted to primarily United States-based companies. Fairchild Aircraft made the leading edge slats, Grumman supplied the flaps, and Rockwell International produced the main fuselage. Production ramp-up for the new narrow-body airliner coincided with the winding-down of the 727 program, and final assembly of the first aircraft began in January 1981. The prototype 757 rolled out of the Renton factory on January 13, 1982. The aircraft, equipped with RB211-535C engines, completed its maiden flight one week ahead of schedule on February 19, 1982. The first flight was affected by an engine stall, following indications of low oil pressure. After checking system diagnostics, company test pilot John Armstrong and co-pilot Lew Wallick were able to restart the affected engine, and the flight proceeded normally thereafter. 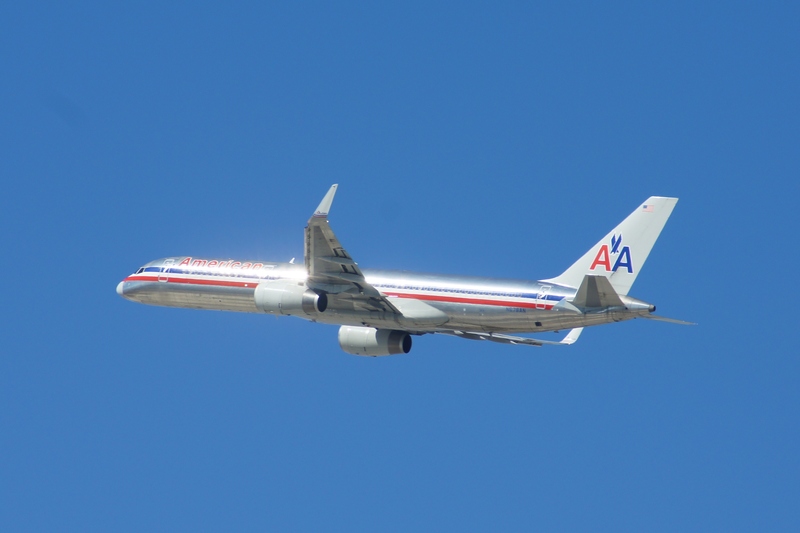 Subsequently, the 757 embarked on a seven-day weekly flight test schedule. By this time, the aircraft had received 136 orders from seven carriers, namely Air Florida, American Airlines, British Airways, Delta Air Lines, Eastern Air Lines, Monarch Airlines, and Transbrasil. The seven-month 757 flight test program used the first five aircraft built. Tasks included flight systems and propulsion tests, hot and cold weather trials, and route-proving flights. Data from the 767 program helped expedite the process. After design issues were identified, the 757's exit doors received dual-spring mechanisms for easier operation, and the fuselage was strengthened for greater bird strike resistance. The production aircraft was 3,600 pounds (1,630 kg) lighter than originally specified, and recorded a three percent better-than-expected rate of fuel burn. This resulted in a range increase of 200 nautical miles (370 km), and prompted Boeing to tout the aircraft's fuel efficiency characteristics. After 1,380 flight test hours, the RB211-powered 757 received United States Federal Aviation Administration (FAA) certification on December 21, 1982, followed by U.K. Civil Aviation Authority (CAA) certification on January 14, 1983. The first delivery to launch customer Eastern Air Lines occurred on December 22, 1982, about four months after the first 767 deliveries. The first 757 with PW2037 engines rolled out about one year later, and was delivered to Delta Air Lines on November 5, 1984. Eastern Air Lines operated the first commercial 757 flight on January 1, 1983, on the Atlanta-to-Tampa route. On February 9, 1983, British Airways began using the aircraft for London-to-Belfast shuttle services, where it replaced Hawker Siddeley Trident 3B trijets. Charter carriers Monarch Airlines and Air Europe also began 757 operations later that year. Early operators noted improved reliability and quieter performance compared with previous jetliners. Transition courses eased pilots' introduction to the new CRT-based cockpit, and no major technical issues arose. Eastern Air Lines, the first 727 operator to take delivery of 757s, confirmed that the aircraft had greater payload capability than its predecessor, along with lower operating costs through improved fuel burn and the use of a two-crew member flight deck. Compared with the 707 and 727, the new twinjet consumed 42 and 40 percent less fuel per seat, respectively, on typical medium-haul flights. Despite the successful debut, 757 sales remained stagnant for most of the 1980s, a consequence of declining fuel prices and a shift to smaller aircraft in the post-deregulation U.S. market. Although no direct competitor existed, 150-seat narrow-bodies such as the McDonnell Douglas MD-80 were cheaper to acquire and carried nearly as many passengers as some airlines' 757s. A three-year sales drought abated in November 1983 when Northwest Airlines placed orders for 20 aircraft, which averted a costly production rate decrease. In December 1985, a freighter model, the 757-200PF, was announced following a launch order for 20 aircraft from UPS Airlines, and in February 1986, a freighter-passenger combi model, the 757-200M, was launched with an order for one aircraft from Royal Nepal Airlines. The freighter model included a main deck cargo hold and entered service with UPS in September 1987. The combi model could carry both cargo and passengers on its main deck and entered service with Royal Nepal Airlines in September 1988. In the late 1980s, increasing airline hub congestion and the onset of U.S. airport noise regulations fueled a turnaround in 757 sales. From 1988 to 1989, airlines placed 322 orders, including a combined 160 orders from American Airlines and United Airlines. By this time, the 757 had become commonplace on short-haul domestic flights and transcontinental services in the U.S., and had replaced aging 707s, 727s, Douglas DC-8s, and McDonnell Douglas DC-9s. The 757-200's maximum range of 3,900 nautical miles (7,220 km), which was over one-and-a-half times the 727's, allowed airlines to use the aircraft on longer nonstop routes. 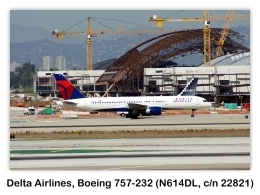 The 757 was also flown out of airports with stringent noise regulations, such as John Wayne Airport in Orange County, California, and airports with aircraft size restrictions, such as Washington National Airport near downtown Washington, D.C. The largest U.S. operators, Delta Air Lines and American Airlines, would ultimately operate fleets of over 100 aircraft each. 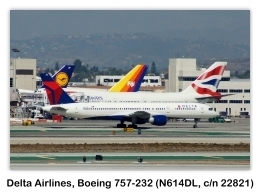 In Europe, British Airways, Iberia, and Icelandair were the 757's largest mainline customers, while other carriers such as Lufthansa rejected the type as too large for their narrow-body aircraft needs. Many European charter airlines, including Air 2000, Air Holland, and LTU International, also acquired the twinjet for holiday and tour package flights in the late 1980s. In Asia, where even bigger aircraft were commonly preferred because of large passenger volumes, the 757 found fewer orders. A 1982 sales demonstration was unable to attract a purchase from potential customer Japan Airlines, and the first Asian customer, Singapore Airlines, sold its four 757s in 1989 in favor of standardizing on the 240-seat wide-body Airbus A310, just five years after debuting the type on Indonesian and Malaysian routes. The 757 fared better in China, where following an initial purchase by the Civil Aviation Administration of China (CAAC) in 1987, orders grew to 59 aircraft, making it the largest Asian market. Operators such as China Southern, China Southwest, Shanghai Airlines, Xiamen Airlines, and Xinjiang Airlines used the 757 on medium length domestic routes. In 1986, the FAA approved RB211-powered 757s for extended-range twin-engine operational performance standards (ETOPS) operations over the North Atlantic, following precedents set by the 767. Under ETOPS regulations, a set of safety standards governing twinjet flights over oceans and other areas without nearby suitable landing sites, airlines began using the aircraft for mid-range intercontinental routes. 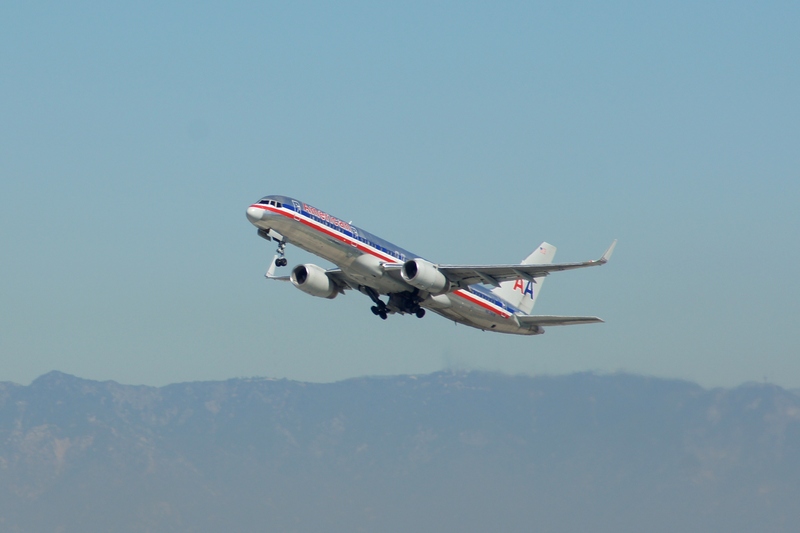 Although the 757 was not originally intended for transoceanic flights, regulators based their decision on its reliable performance record on extended transcontinental U.S. services. ETOPS certification for 757s equipped with PW2000 series engines was granted in 1992. In the early 1990s, the FAA and other U.S. government agencies, including the National Aeronautics and Space Administration (NASA) and the National Transportation Safety Board (NTSB), began studying the 757's wake turbulence characteristics. This followed several incidents, including two fatal crashes, in which small private aircraft experienced loss of control when flying close behind the twinjet. 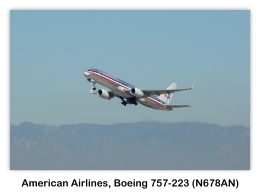 Smaller airliners had also suffered unexpected rolling movements when flying behind 757s. Investigators focused on the aircraft's aft-loaded wing design, which at certain points during takeoff or landing could produce wingtip vortices that were stronger than those emanating from larger 767s and 747s. 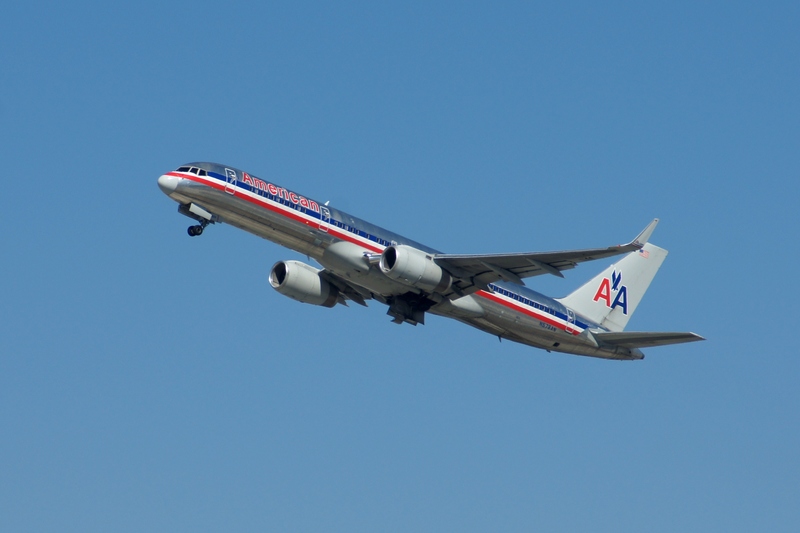 Other tests were inconclusive, leading to debate among government agencies, and in 1994 and 1996 the FAA updated air traffic control regulations to require greater separation behind the 757 than other large-category jets. 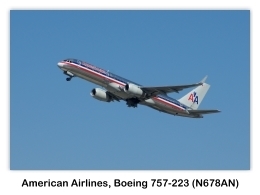 The 757 became the only sub-300,000-pound (136,000 kg) airliner to be classified as a "heavy" jet, alongside wide-body aircraft, under FAA separation rules. Production of the 757 peaked at an annual rate of 100 aircraft in the early 1990s, during which time upgraded models came under consideration. For over a decade, the narrow-body twinjet had been its manufacturer's only single-aisle airliner without a stretched variant, and while rumors of a long-range 757-200X and stretched 757-300X persisted, no formal announcements had been made. European charter carriers were particularly interested in a higher-capacity version which could take better advantage of the 757's range. Besides meeting the needs of charter customers, a larger model would enable Boeing to match the passenger lift capabilities of the 767-200 with lower operating costs, and counter longer-range versions of the 185-seat Airbus A321, a new stretched variant of the A320 narrow-body airliner. In September 1996, following a launch order for 12 aircraft from charter carrier Condor, Boeing announced the stretched 757-300 at the Farnborough Airshow. The new model was a 23.4-foot (7.13 m) stretch of the 757-200, resulting in room for 50 more passengers and nearly 50 percent more cargo. The type's design phase was intended to be the shortest in its manufacturer's history, with 27 months from launch to certification. Due to development and cost concerns, radical upgrades such as a Next Generation 737-style advanced cockpit were not implemented. Instead, the stretched derivative received upgraded engines, enhanced avionics, and a redesigned interior. 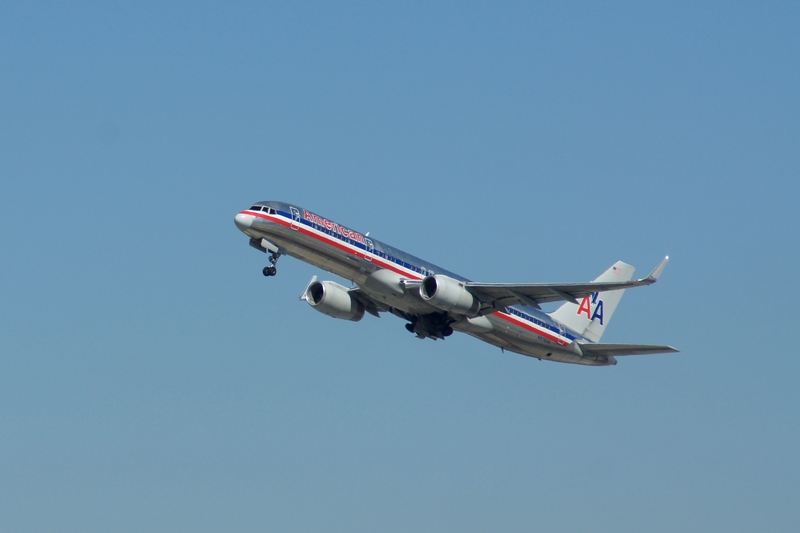 The first 757-300 rolled out on May 31, 1998, and completed its maiden flight on August 2, 1998. Following regulatory certification in January 1999, the type entered service with Condor on March 19, 1999. The 757-300 was also ordered by American Trans Air, Arkia Israel Airlines, Continental Airlines, Icelandair, and Northwest Airlines. Sales for the type remained slow, and ultimately totaled 55 aircraft. 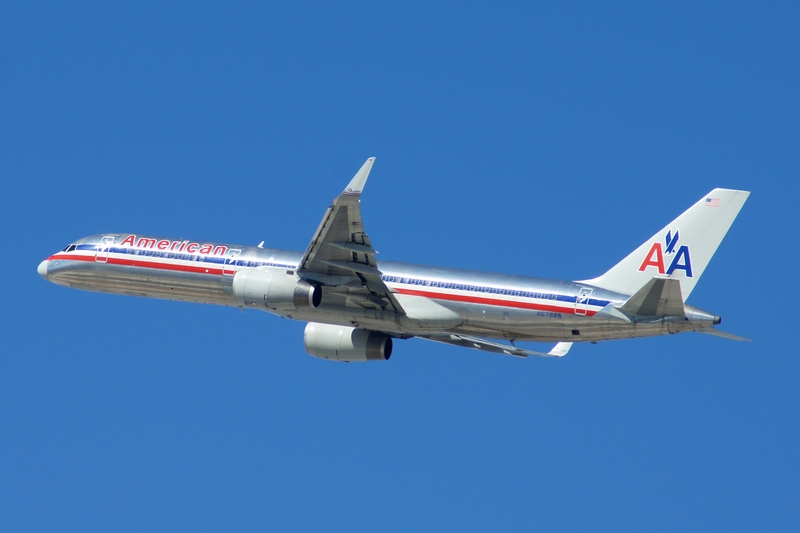 Boeing had targeted the 757-300 as a potential 767-200 replacement for two of its largest customers, American Airlines and United Airlines, but neither were in a financial position to commit to new aircraft. Overtures to other charter airlines also did not result in further orders. By November 1999, faced with diminishing sales and a reduced backlog despite the launch of the 757-300, Boeing began studying a decrease in 757 production rates. While the 757 program had been financially successful, declining sales in the early 2000s threatened its continued viability. Airlines were again gravitating toward smaller aircraft, now mainly the 737 and A320, because of their reduced financial risk. An airline industry downturn and the large number of relatively young 757s already in service also reduced customer demand. In 2000, spurred by interest from Air 2000 and Continental Airlines, Boeing reexamined the possibility of building a longer-range 757-200X. The proposed derivative would have featured auxiliary fuel tanks, plus wing and landing gear upgrades from the 757-300, resulting in a higher MTOW and a potential range increase to over 5,000 nautical miles (9,260 km). However, the proposal failed to garner any orders. In March 2001, Boeing delivered the first 757-200SF, a second-hand 757-200 converted for freighter use, to DHL Aviation. The 757-200SF marked the manufacturer's first foray into passenger-to-freighter conversions. Customer interest in new 757s continued to decline, and in 2003, a renewed sales campaign centered on the 757-300 and 757-200PF yielded only five new orders. In October 2003, following Continental Airlines' decision to switch its remaining 757-300 orders to the 737-800, Boeing announced the end of 757 production. The 1,050th and last example, a 757-200 built for Shanghai Airlines, rolled off the production line at the Renton factory on October 28, 2004, and was delivered on November 28, 2005, after several months of storage. With the conclusion of the 757 program, Boeing consolidated 737 assembly at its Renton factory, downsizing its facilities by 40 percent and shifting staff to different locations. 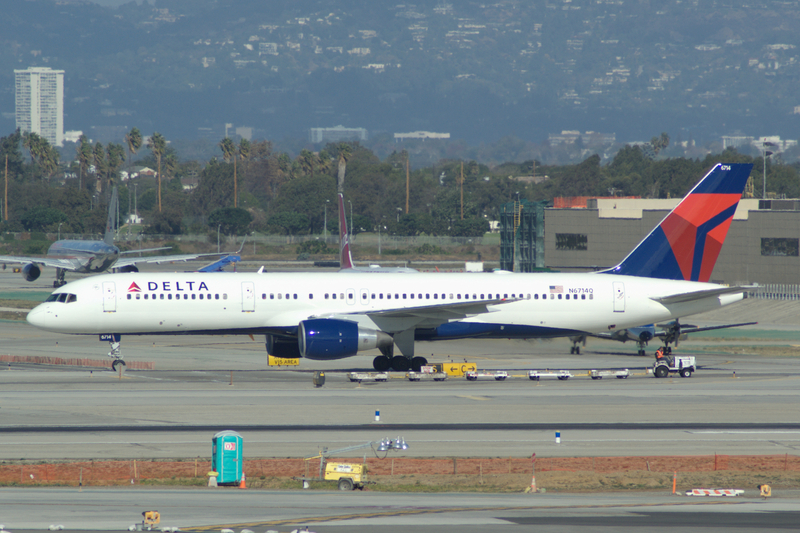 Since the end of production, most 757s have remained in service, mainly in the U.S. From 2004 to 2008, the average fuel cost for typical mid-range U.S. domestic 757 flights tripled, putting pressure on airlines to improve the fuel efficiency of their fleets. In May 2005, the FAA granted regulatory approval for manufacturer-sanctioned blended winglets from Aviation Partners Incorporated as a retrofit on the 757-200. The winglets improve fuel efficiency by five percent and increase range by 200 nautical miles (370 km) through the reduction of lift-induced drag. Continental Airlines was the first carrier to order winglets for the 757-200, and in February 2009 became the first operator of 757-300s with winglets. In the 2010s, the 757 has remained the only narrow-body aircraft in use by the large fleets of all three U.S. legacy carriers: American Airlines, Delta Air Lines and United Airlines. During this period, the 757's capacity and range capabilities have remained largely unequaled among narrow-body airliners; when selecting replacement aircraft, airlines have had to either downsize to smaller single-aisle aircraft in production with fewer seats and less range such as the 737-900ER and A321, or upsize to the larger, longer-range 787 Dreamliner and A330-200 wide-body jets.] The Tupolev Tu-204, a narrow-body twinjet introduced in 1989 with a design similar to the 757's, is offered in a 200-seat version, which has seen limited production for mainly Russian customers. Within Boeing, the 215-seat, 3,200-nautical-mile (5,930 km) range 737-900ER has been regarded as the closest aircraft in production to the 757-200. Boeing officials stated in 2011 that the manufacturer had no plans to develop a dedicated 200-seat airliner to replace its largest narrow-body aircraft. Instead, a new airliner family, code-named Y1, was being considered for the 145-seat to 180-seat markets covered by the 737-700 and 737-800. Stretched Y1 models or a medium-range version of the 787 Dreamliner were possible replacements for the 757. In 2012, after shelving the Y1 project in favor of the redesigned and re-engined 737 MAX family, Boeing indicated that the larger 737 MAX models (particularly the largest and longest range variant, 737 MAX 9) would cover the bulk of the 757 replacement market. Company officials further emphasized that up to 95 percent of the 757's current routes could be flown by the 737 MAX. In 2014, Airbus launched the Airbus A321neoLR, a model with three auxiliary fuel tanks and seating for 206 passengers. The European manufacturer states that the new variant will exceed the range of a 757-200 with winglets and be more fuel-efficient. In response, the options open to Boeing include developing and building a new aircraft, whose cost could reach US$15 billion, or revising and enhancing the 767, as well as reengining and improving the wings of the existing 757. Officials at Air Lease Corporation, which has ordered the Airbus A321neoLR, have urged Boeing to build an all-new twin-aisle airplane for 7,000 feet (2,130 m) runways. However, Boeing officials have declined to respond directly to Airbus' decision to launch the A321neoLR, and have dismissed its rival's projections of demand for 1,000 aircraft; instead, the company now considers the space between the 737 MAX 9 and the 787-8 to be a niche, and foresees a more modest, incremental market. 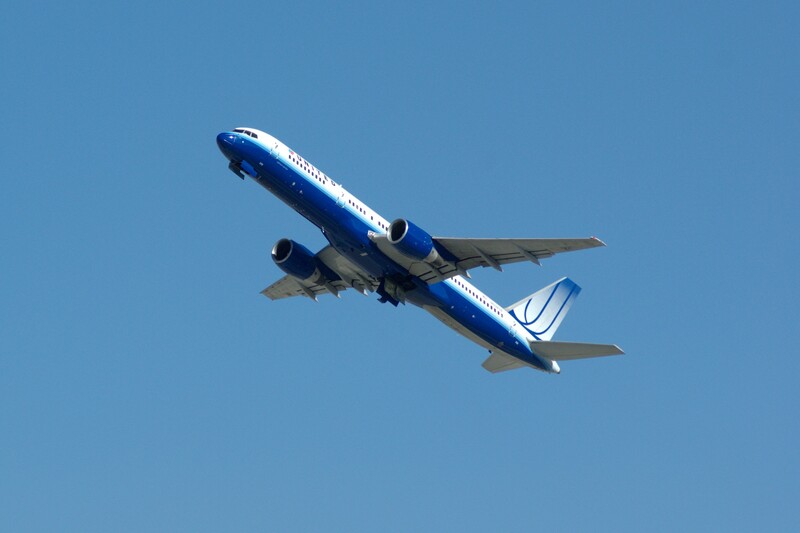 Boeing officials have also dismissed suggestions to reengine the 757. 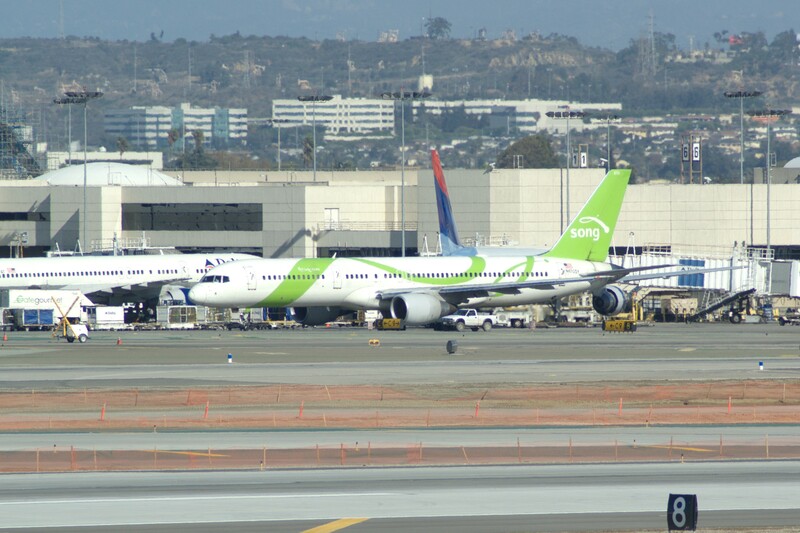 Whether the 757 replacement market is commercially viable has been debated by aviation industry analysts, with some skeptics pointing to the fact that over 150 aircraft, or approximately 15 percent of the worldwide 757 fleet, are currently unused and parked in desert storage. In early 2015, Boeing disclosed that it was conducting studies for a long-haul 757 successor aimed at transatlantic routes too long for the A321neoLR and 737 MAX 9. Such an aircraft would carry more passengers than the 737 MAX and have more range than the 757. 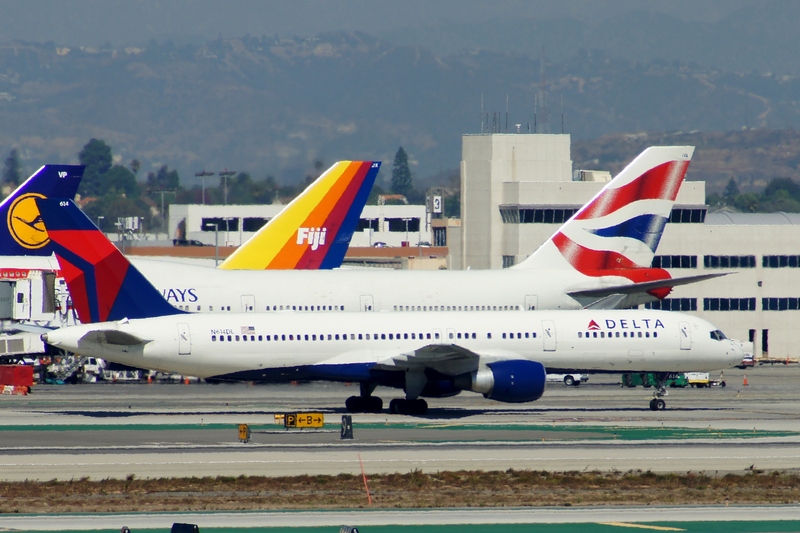 A parallel development along with the 737 replacement, similar to when the 757 and 767 were developed in the 1970s, is under consideration. 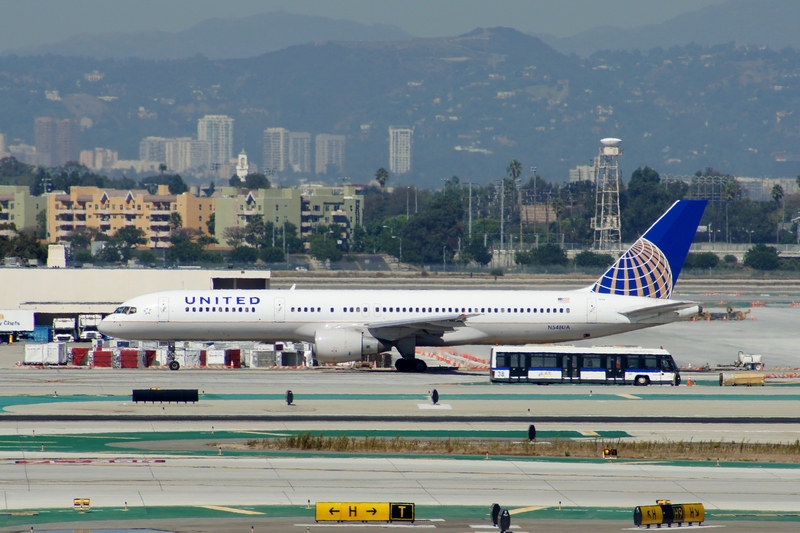 As of February 2015, Boeing has not committed to a replacement (which would be available after the 777X), but is polling customers such as United Airlines on how to fill the gap between the 737 MAX 9 and the 787. Boeing calls the successor airliner "MOM" for Middle of Market. The airplane could likely seat 220 passengers and be sized between the 737 and 787-8 Dreamliner. The 757 is a low-wing cantilever monoplane with a conventional tail unit featuring a single fin and rudder. Each wing features a supercritical cross-section and is equipped with five-panel leading edge slats, single-flaps and double-slotted flaps, an outboard aileron, and six spoilers. The wings are largely identical across all 757 variants, swept at 25 degrees, and optimized for a cruising speed of Mach 0.8 (533 mph or 858 km/h). The reduced wing sweep eliminates the need for inboard ailerons, yet incurs little drag penalty on short and medium length routes, during which most of the flight is spent climbing or descending. The airframe further incorporates carbon-fiber reinforced plastic wing surfaces, Kevlar fairings and access panels, plus improved aluminum alloys, which together reduce overall weight by 2,100 pounds (950 kg). To distribute the aircraft's weight on the ground, the 757 has a retractable tricycle landing gear with four wheels on each main gear and two for the nose gear. The landing gear was purposely designed to be taller than the company's previous narrow-body aircraft in order to provide ground clearance for stretched models. In 1982, the 757-200 became the first subsonic jetliner to offer carbon brakes as a factory option, supplied by Dunlop. The stretched 757-300 features a retractable tailskid on its aft fuselage to prevent damage if the tail section contacts the runway surface during takeoff. Besides common avionics and computer systems, the 757 shares its auxiliary power unit, electric power systems, flight deck, and hydraulic parts with the 767. Through operational commonality, 757 pilots can obtain a common type rating to fly the 767 and share the same seniority roster with pilots of either aircraft. This reduces costs for airlines that operate both twinjets. The 757's flight deck uses six Rockwell Collins CRT screens to display flight instrumentation, as well as an electronic flight instrument system (EFIS) and an engine indication and crew alerting system (EICAS). These systems allow the pilots to handle monitoring tasks previously performed by the flight engineer. An enhanced flight management system, improved over versions used on early 747s, automates navigation and other functions, while an automatic landing system facilitates CAT IIIb instrument landings in 490 feet (150 m) low visibility conditions. The inertial reference system (IRS) which debuted with the 757-200 was the first to feature laser-light gyros. On the 757-300, the upgraded flight deck features a Honeywell Pegasus flight management computer, enhanced EICAS, and updated software systems. To accommodate the same flight deck design as the 767, the 757 has a more rounded nose section than previous narrow-body aircraft. The resulting space has unobstructed panel visibility and room for an observer seat. Similar pilot viewing angles as the 767 result from a downward sloped cockpit floor and the same forward cockpit windows. Three independent hydraulic systems are installed on the 757, one powered by each engine, and the third using electric pumps. A ram air turbine is fitted to provide power for essential controls in the event of an emergency. A basic form of fly-by-wire facilitates spoiler operation, utilizing electric signaling instead of traditional control cables. The fly-by-wire system, shared with the 767, reduces weight and provides for the independent operation of individual spoilers. When equipped for extended-range operations, the 757 features a backup hydraulic motor generator and an additional cooling fan in the aircraft's electronics bay. The 757 interior allows seat arrangements of up to six per row with a single center aisle. Originally optimized for flights averaging two hours, the 757 features interior lighting and cabin architecture designs aimed at a more spacious impression. As on the 767, garment-bag-length overhead bins and a rear economy-class galley are standard equipment. The bins have twice the capacity as those on the preceding 727. To save weight, honeycomb sandwich is used for interior paneling and bins. Unlike previous evacuation slide designs which are not equipped for water landings, the 757's main exits feature combination slide rafts similar to those found on the 747. In the 1980s, Boeing altered the interior designs of its other narrow-body aircraft to be similar to that of the 757. In 1998, the 757-300 debuted a redesigned interior derived from the Next Generation 737 and 777, including sculptured ceiling panels, indirect lighting, and larger overhead bins with an optional continuous handrail built into their base for the entire cabin length. Centerline storage containers mounted in the aisle ceiling for additional escape rafts and other emergency equipment were also added. The 757-300's interior later became an option on all new 757-200s. In 2000, with wheeled carry-on baggage becoming more popular, Delta Air Lines began installing overhead bin extensions on their 757-200s to provide additional storage space, and American Airlines did the same in 2001. The larger bins are part of aftermarket interior upgrades which include updated ceiling panels and lighting. The 757 was produced in standard and stretched lengths. The original 757-200 debuted as a passenger model, and was subsequently developed into the 757-200PF and 757-200SF cargo models, as well as the convertible 757-200M variant. The stretched 757-300 was only available as a passenger model. 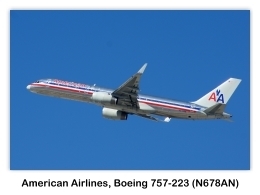 When referring to different versions, Boeing and airlines have been known to collapse the model number (757) and the variant designator (e.g. 757-200 757-300) into a truncated form (e.g. "752" or "753"). 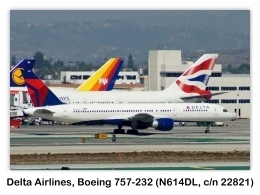 The International Civil Aviation Organization (ICAO) classifies all variants based on the 757-200 under the code "B752", while the 757-300 is referred to as "B753." The 757-200, the original version of the aircraft, entered service with Eastern Air Lines in 1983. The type was produced with two different door configurations, both with three standard cabin doors per side: the baseline version has a fourth, smaller cabin door on each side aft of the wings, and is certified for a maximum capacity of 239, while the alternate version has a pair of over-the-wing emergency exits on each side, and can seat a maximum of 224. The 757-200 was offered with a MTOW of up to 255,000 pounds (116,000 kg); some airlines and publications have referred to higher gross weight versions with ETOPS certification as "757-200ERs", but this designation is not used by the manufacturer. 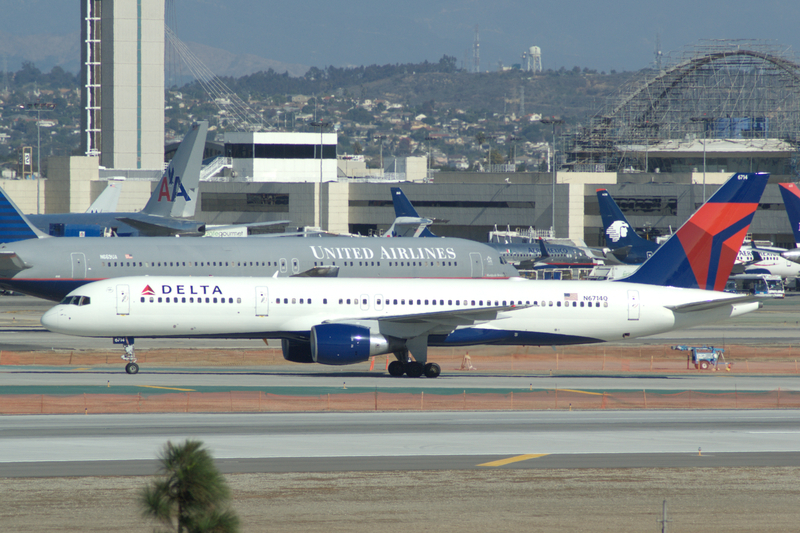 Similarly, versions with winglets are sometimes called "757-200W" or "757-200WL". The first engine to power the 757-200, the Rolls-Royce RB211-535C, was succeeded by the upgraded RB211-535E4 in October 1984. Other engines used include the RB211-535E4B, along with the PW2037 and PW2040 from Pratt & Whitney. Its range with full payload is 3,850 nautical miles (7,130 km). Although designed for short and medium length routes, the 757-200 has since been used in a variety of roles ranging from high-frequency shuttle services to transatlantic routes. 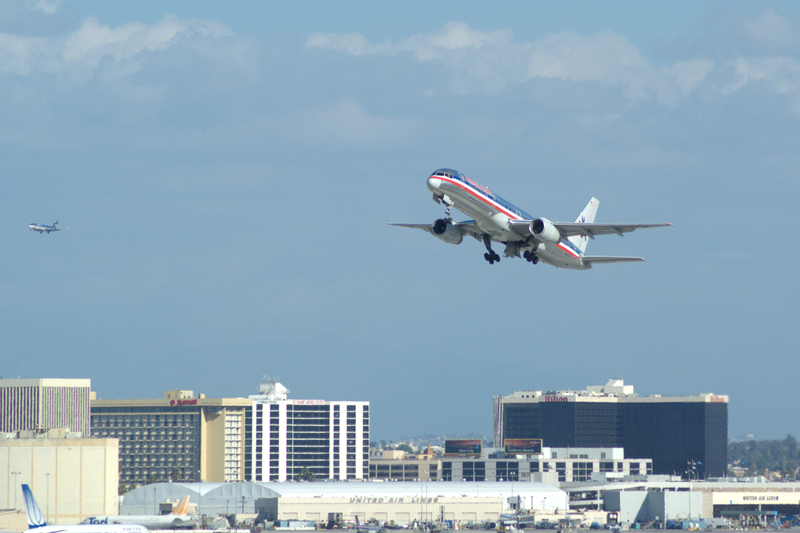 In 1992, after gaining ETOPS approval, American Trans Air launched 757-200 transpacific services between Tucson and Honolulu. Since the turn of the century, mainline U.S. carriers have increasingly deployed the type on transatlantic routes to Europe, and particularly to smaller cities where passenger volumes are unable to support wide-body aircraft. Production for the 757-200 totaled 913 aircraft, making the type by far the most popular 757 model. In July 2015, 683 of different 757-200 versions were in service. 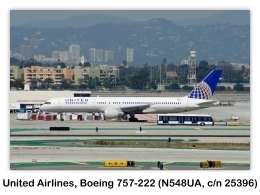 The longest commercial route served by a 757 is United Airlines' New York to Berlin flight at over 4,000 nautical miles (7,410 km) as of February 2015; the aircraft assigned to this route cannot fly with full payload. United's 757s assigned to transatlantic routes are fitted with 169 seats. The 757-200PF, the production cargo version of the 757-200, entered service with UPS Airlines in 1987. Targeted at the overnight package delivery market, the freighter can carry up to 15 containers or pallets on its main deck, for a volume of up to 6,600 cubic feet (187 m³), while its two lower holds can carry up to 1,830 cubic feet (51.8 m³) of bulk cargo. The maximum revenue payload capability is 87,700 pounds (39,800 kg) including container weight. The 757-200PF is specified with a MTOW of 255,000 pounds (116,000 kg) for maximal range performance; when fully loaded, the aircraft can fly up to 3,150 nautical miles (5,830 km). Because the freighter does not carry any passengers, it can operate transatlantic flights free of ETOPS restrictions. Power is provided by RB211-535E4B engines from Rolls-Royce, or PW2037 and PW2040 engines from Pratt & Whitney. The freighter features a large, upward-opening main deck cargo door on its forward port-side fuselage. Adjacent to the large cargo door is a standard exit door used by the pilots. All other emergency exits are omitted, and cabin windows and passenger amenities are not available. The main deck cargo hold has a smooth fiberglass lining, and a fixed rigid barrier with a sliding access door serves as a restraint wall next to the flight deck. Both lower holds can be equipped with a telescoping baggage system to load custom-fitted cargo modules. When equipped for extended-range transatlantic operations, UPS 757-200PFs feature an upgraded auxiliary power unit, additional cargo bay fire suppression equipment, enhanced avionics, and an optional supplemental fuel tank in the aft lower hold. Total production for the 757-200PF totaled 80 aircraft. In July 2015, 79 of these were in service. The 757-200M, a convertible version capable of carrying cargo and passengers on its main deck, entered service with Royal Nepal Airlines in 1988. Also known as the 757-200 Combi, the type retains the passenger windows and cabin doors of the 757-200, while adding a forward port-side cargo door in the manner of the 757-200PF. Kathmandu-based Royal Nepal Airlines, later renamed Nepal Airlines, included the convertible model as part of an order for two 757s in 1986. Nepal Airlines ordered the 757-200M to fulfill a requirement for an aircraft that could carry mixed passenger and freight loads, and operate out of Tribhuvan International Airport in the foothills of the Himalayas. Patterned after convertible variants of the 737 and 747, the 757-200M can carry two to four cargo pallets on its main deck, along with 123 to 148 passengers in the remaining cabin space. Nepal Airlines' 757-200M, which features Rolls-Royce RB211-535E4 engines and an increased MTOW of 240,000 pounds (109,000 kg), was the only production example ever ordered. In October 2010, Pemco World Air Services and Precision Conversions launched aftermarket conversion programs to modify 757-200s into 757 Combi aircraft. Vision Technologies Systems launched a similar program in December 2011. All three aftermarket conversions modify the forward portion of the aircraft to provide room for up to ten cargo pallets, while leaving the remaining space to fit around 45 to 58 passenger seats. This configuration is targeted at commercial charter flights which transport heavy equipment and personnel simultaneously. Customers for converted 757 Combi aircraft include the Air Transport Services Group, National Airlines, and North American Airlines. The 757-200SF, a conversion of passenger 757-200s for cargo use, entered service with DHL Aviation in 2001. Modifications by Boeing Wichita in Kansas included the removal of passenger amenities, main deck structural reinforcement, and the installation of a 757-200PF forward fuselage section with a port-side cargo door. The forward two entry doors are retained, resulting in a main deck cargo capacity of 14 pallets, which is one less than the 757-200PF. Environmental controls can be fitted for animal cargo, and rear exits and window pairs are retained on some aircraft. Besides Boeing, Israel Aerospace Industries, Precision Conversions, and ST Aerospace Services have also handled 757-200SF conversions. In September 2006, FedEx Express announced a US$2.6 billion plan to acquire over 80 converted 757 freighters to replace its 727 fleet. In July 2015, 173 converted 757-200SFs were in service. The 757-300, the stretched version of the aircraft, entered service with Condor in 1999. With an overall length of 178.7 feet (54.5 m), the type is the longest single-aisle twinjet ever built. Designed to serve the charter airline market and provide a low-cost replacement for the 767-200, the 757-300 shares the basic design of the original 757, while extending the fuselage before and after the wings. Eight standard cabin doors, plus a pair of over-the-wing emergency exits on each side, enable the 757-300 to have a maximum certified capacity of 295 passengers A higher MTOW of 272,500 pounds (124,000 kg) is specified, while fuel capacity remains unchanged; as a result, the stretched variant offers a maximum range of 3,395 nautical miles (6,290 km). Engines used on the type include the RB211-535E4B from Rolls-Royce and the PW2043 from Pratt & Whitney. Due to its greater length, the 757-300 features a retractable tailskid on its aft fuselage. Condor ordered the stretched 757 to replace its McDonnell Douglas DC-10s and serve as low-cost, high-density transportation to holiday destinations such as the Canary Islands. Because tests showed that boarding the 757-300 could take up to eight minutes longer than the 757-200, Boeing and Condor developed zone-based boarding procedures to expedite loading and unloading times for the lengthened aircraft. 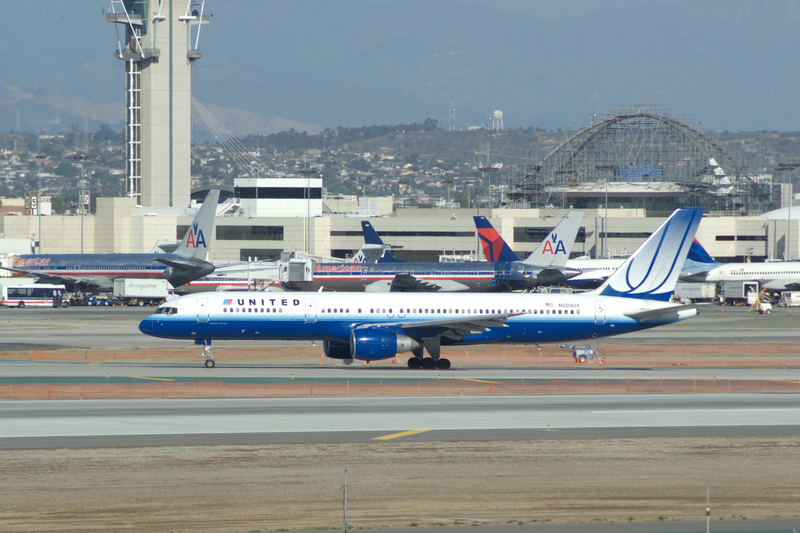 The 757-300 has been operated by mainline carriers Continental Airlines (now part of United Airlines), Northwest Airlines (now part of Delta Air Lines), and Icelandair; other operators have included American Trans Air (the first North American operator), Arkia Israel Airlines, along with charter carriers Condor and Thomas Cook Airlines. Production for the 757-300 totaled 55 aircraft. All 55 were in service in July 2015. Government, military, and private customers have acquired the 757 for uses ranging from aeronautical testing and research to cargo and VIP transport. 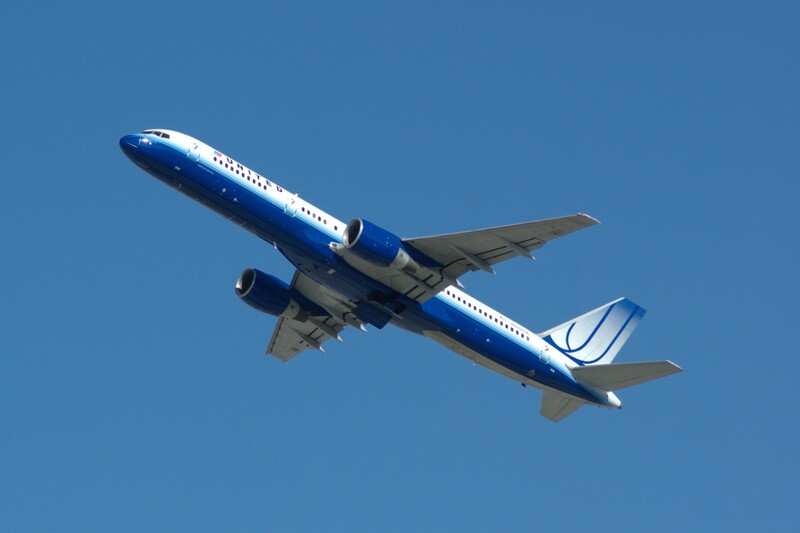 The 757-200, the most widely ordered version of the aircraft, has formed the basis for these applications. The first government operator of the 757 was the Mexican Air Force, which took delivery of a VIP-configured 757-200 in November 1987. Airborne Research Integrated Experiments System - ARIES, a NASA platform for air safety and operational research, was created in 1999 using the second production 757. 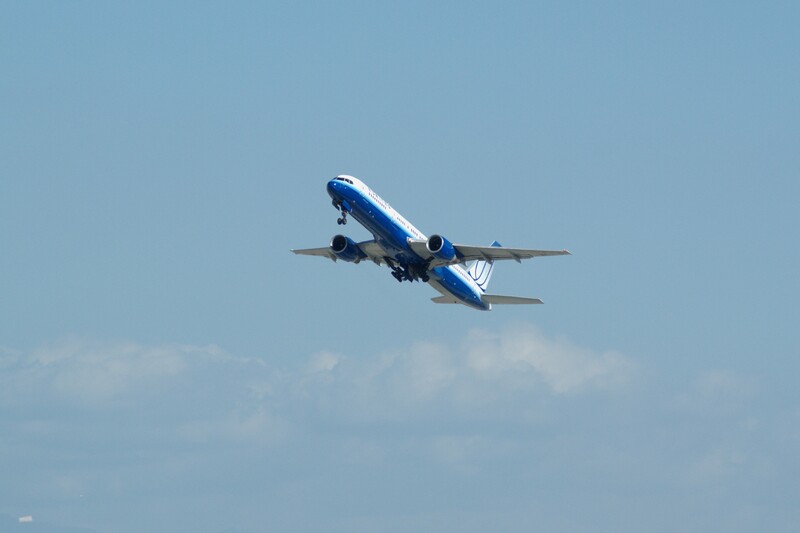 The aircraft originally flew in the 757 flight test program before entering service with Eastern Air Lines. After NASA purchased the aircraft in 1994 to replace its 737-100 testbed, it was initially used to evaluate a hybrid laminar flow control system, avionics systems for the proposed Northrop YF-23 Black Widow II jet fighter, and the 777's fly-by-wire control system. Equipped with a flight deck research station, on-board laboratories, and two experimental flight decks, ARIES was used for evaluating weather information and landing approach systems, as well as runway friction tests. ARIES went into storage in 2006. C-32A - the United States Air Force (USAF) operates four VIP-configured 757-200s under the designation C-32A, with missions including the transport of the Vice President of the United States under the callsign Air Force Two. The C-32As are outfitted with a communication center, conference room, seating area, and private living quarters. C-32B - The USAF also operates two 45-seat 757-200 aircraft, designated C-32B, for use by the U.S. State Department Foreign Emergency Support Team. The C-32As feature the blue-and-white paint scheme used by the USAF for its VIP transport fleet, while the C-32Bs are painted in solid white with minimal identification markings. [ The first C-32s were delivered in 1998 and replaced C-137 transports. F-22 Flying Testbed - the first 757 built was used in 1998 as a testbed for Lockheed Martin F-22 Raptor avionics and sensor integration. The Boeing-owned aircraft was fitted with a canard above its cockpit to simulate the jet fighter's wing sensor layout, along with a forward F-22 fuselage section with radar and other systems, and a 30-seat laboratory with communication, electronic warfare, identification, and navigation sensors. and conducted jointly with NASA as part of the agency’s Environmentally Responsible Aviation (ERA) program. While the left wing tests the Kreuger flaps, the right wing is being used to test coatings that prevent insects from adhering to the wing. Success here will open the door to the application of Natural Laminar Flow to reduce fuel burn. Active Flow Control System - Boeing has mounted 31 active flow jets mounted ahead of the rudder's leading edge. They receive air from the Auxiliary Power Unit (APU). Their purpose is to recover air flow that has separated from the rudder and redirect it to the rudder so that the rudder regains effectiveness, even at high deflection angles. The air exiting the APU is very hot, at 380 degrees F, and is cooled by a heat exchanger mounted under the aft fuselage, which is connected to the ducts running along the front and back of the stabilizer's spars. This ensures an even air supply at all times. Royal New Zealand Air Force 757 Combi - the Royal New Zealand Air Force (RNZAF) operates two 757s converted to 757-200M standard by ST Aerospace Services for delivering equipment, medical evacuation, troop movements, and VIP transport. A cargo door, upgraded auxiliary power unit, enhanced communications systems, and retractable airstairs are fitted. The aircraft, which replaced two 727-100QCs, have carried the Prime Minister of New Zealand, and flown to the ice-covered Pegasus Field near New Zealand's Scott Base in McMurdo Sound, Antarctica. VIP transport - the 757-200 serves as VIP transports for the President of Argentina under the Presidential Air Group serial Tango 01 and for the President of Mexico under the Mexican Air Force call sign TP01 or Transporte Presidencial 1. A Royal Brunei Airlines 757-200 was used by the Sultan of Brunei in the 1980s before being sold to the Government of Kazakhstan in 1995. The royal family of Saudi Arabia uses a 757-200 as a flying hospital. During the 2004 U.S. presidential election, Senator John Kerry chartered a 757-200 from TransMeridian Airlines nicknamed "Freedom Bird" as his campaign jet. During the 2008 U.S. presidential election, then-Senator Barack Obama chartered a 757-200 from North American Airlines for the same purpose. In 2008, British heavy metal band Iron Maiden chartered and customized a 757 (nicknamed "Ed Force One", and of which singer Bruce Dickinson was the pilot) for their "Somewhere Back in Time World Tour". Since the 2000s, Dallas Mavericks owner Mark Cuban has used his personal 757-200 to transport team members between games. 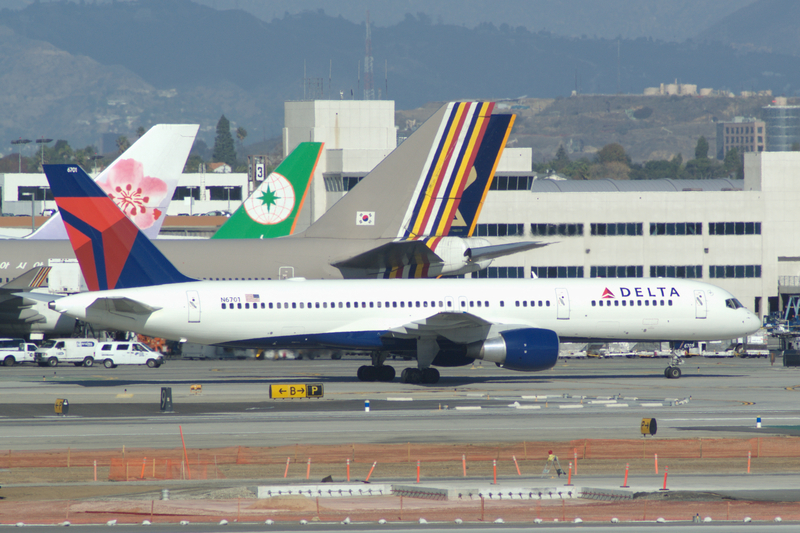 The largest 757 operators are Delta Air Lines, FedEx Express and United Airlines; Delta Air Lines is the largest overall, with a 757 fleet of 138 aircraft as of 2015. 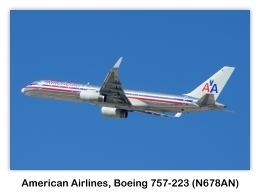 American Airlines' 757 fleet of 142 aircraft was the largest until 2007, when the carrier retired Pratt & Whitney PW2000-powered models acquired from TWA in order to standardize around a Rolls-Royce RB211-powered fleet. 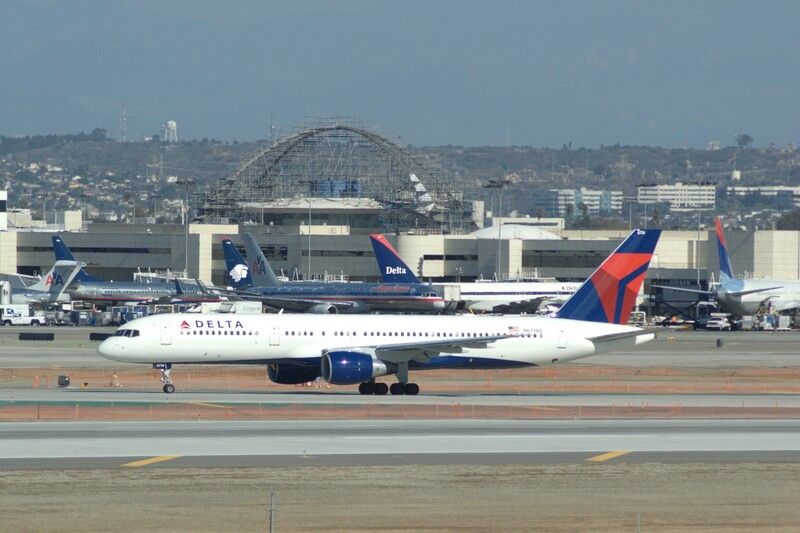 Delta subsequently acquired 17 former American Airlines 757s, and in October 2008 gained 45 more 757s from its merger with Northwest Airlines. For a complete list of Boeing 757 operators, visit the following Wikipedia article, List of Boeing 757 Operators. The cargo carrier with the most 757s is FedEx Express, which operated a 757-200SF fleet of 96 aircraft in July 2015. The largest operator of the 757-200PF is UPS Airlines, with 75 aircraft in July 2015. DHL Aviation and its affiliated companies, DHL Air UK, DHL Latin America, European Air Transport Leipzig, and Blue Dart Aviation, combined operate 43 cargo 757s of various types in 2015. Joint launch customer British Airways operated the 757-200 for 27 years before retiring the type in November 2010. To celebrate the fleet's retirement, the airline unveiled one of its last three 757-200s in a retro style livery on October 4, 2010, matching the color scheme that it introduced the aircraft into service with in 1983. Subsequently, the type remained in operation with the company's subsidiary, OpenSkies. 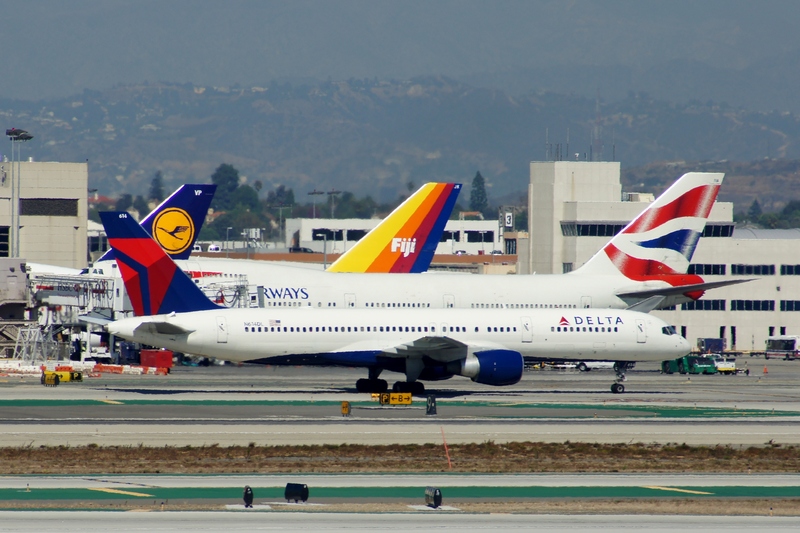 A total of 738 aircraft (all 757 variants) were in airline service in July 2015 with operators Delta Air Lines (138), FedEx Express (96), United Airlines (91), American Airlines (84), UPS Airlines (75), Icelandair (26), DHL Air (21), and other airlines with fewer aircraft of the type. 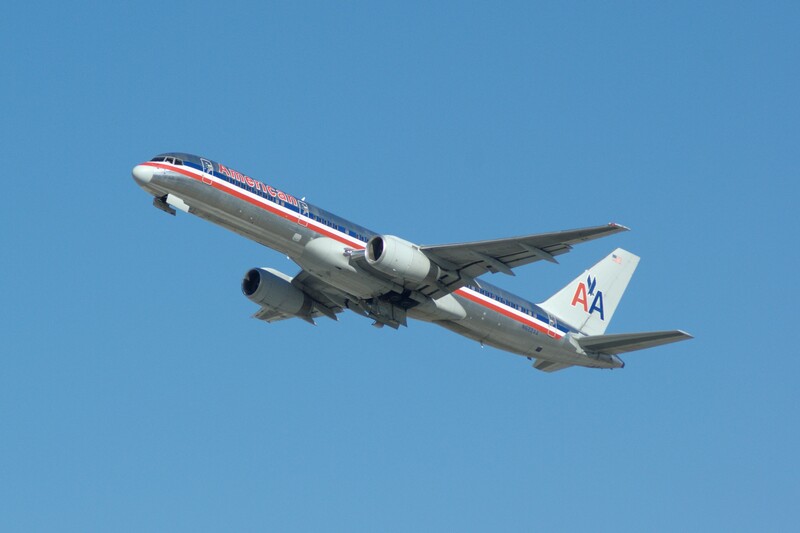 Over the duration of the 757 program, 1,049 aircraft were ordered and delivered, and 1,050 examples were built. The prototype 757 was not delivered and remained with the manufacturer for testing purposes. As of October 2015, the 757 has been involved in 29 aviation occurrences, including 8 hull-loss accidents. Seven crashes and 11 hijackings have resulted in 574 occupant fatalities. The first fatal event involving the aircraft occurred on October 2, 1990, when a hijacked Xiamen Airlines 737 collided with a China Southern Airlines 757 on the runways of Guangzhou Baiyun International Airport, China, killing 46 of the 122 people on board. 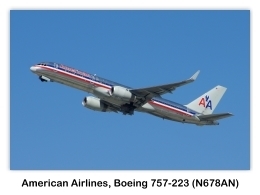 Two 757-200s were hijacked in the September 11 attacks; hijackers crashed American Airlines Flight 77 into the Pentagon in Arlington, Virginia, killing all 64 on board and 125 on the ground, and United Airlines Flight 93 was also hijacked and crashed near Shanksville, Pennsylvania, killing all 44 on board. Accidents involving human error include American Airlines Flight 965, which crashed into a mountain in Buga, Colombia, on December 20, 1995, killing 151 passengers and eight crew members with four survivors, and the mid-air collision of DHL Flight 611 near Überlingen, Baden-WÜrttemberg, Germany, on July 1, 2002, with the loss of two on board plus 69 on a Bashkirian Airlines Tupolev Tu-154. 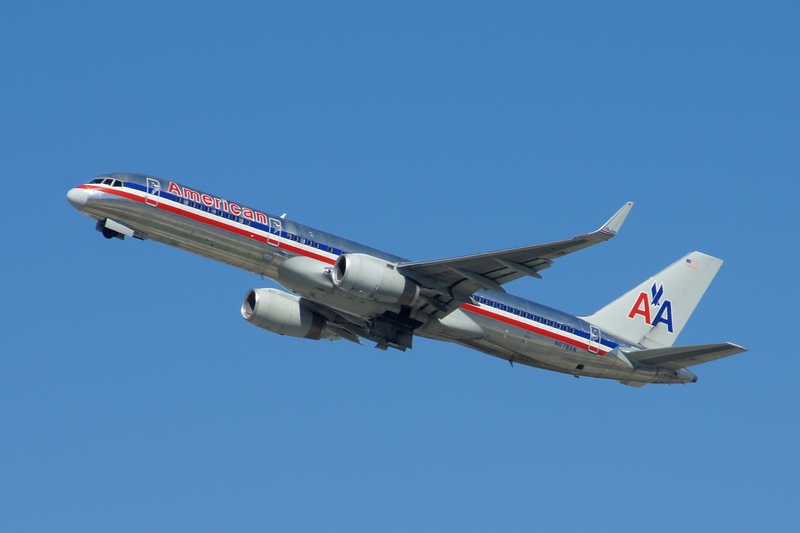 American Airlines Flight 965 was blamed on navigational errors by the crew, while DHL Flight 611 involved air traffic control errors. Accidents attributed to pilot disorientation due to improperly maintained instruments include Birgenair Flight 301 on February 6, 1996, in Puerto Plata, Dominican Republic, with the loss of all 189 passengers and crew, and Aeroperú Flight 603 on October 2, 1996, off the coast of Pasamayo, Peru, with the loss of all 70 on board. In the Birgenair accident, investigators found that the aircraft had been stored without the necessary covers for its pitot tube sensors, thus allowing insects and debris to collect within, while in the Aeroperú accident, protective tape covering static vent sensors had not been removed. Two private aircraft crashes were blamed on wake turbulence emanating from 757s. On December 18, 1992, a Cessna Citation crashed near Billings Logan International Airport in Montana, killing all six aboard, and on December 15, 1993, an IAI Westwind crashed near John Wayne Airport in California, killing all five aboard. 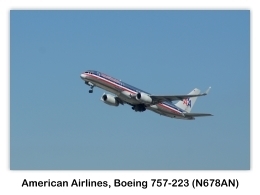 Both airplanes had been flying less than three nautical miles (5.56 km) behind a 757. The FAA subsequently increased the required separation between small aircraft and 757s from four to five nautical miles (7.41 to 9.26 km). On September 14, 1999, Britannia Airways Flight 226A crash landed near Girona-Costa Brava Airport, Spain, during a thunderstorm; the 757's fuselage broke into several pieces. All 245 occupants evacuated successfully. 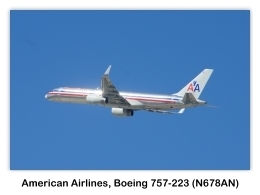 On October 25, 2010, American Airlines Flight 1640, a 757 flying between Miami and Boston, safely returned to Miami after suffering the loss of a two-foot (0.61 m) fuselage section at an altitude of approximately 31,000 feet. After investigating the incident, the FAA ordered all 757 operators in the U.S. to regularly inspect upper fuselage sections of their aircraft for structural fatigue. One complete aircraft, Delta Air Lines' 757-200 registered N608DA, has been retired and is on display at the Delta Flight Museum in Atlanta, Georgia. The aircraft was the sixty-fourth example built. Prior to being moved to its permanent location, the aircraft was repainted in its originally delivered livery; it is now on static display at the museum entrance. The National Air and Space Museum of the Smithsonian Institution in Washington, D.C. features a 757-200 fuselage section as part of its "How Things Fly" exhibition at its National Mall gallery. Visitors are able to walk through the cabin. The fuselage was donated by Boeing and was previously part of a test aircraft; the interior fittings were donated by United Airlines and installed into the aircraft section for exhibition purposes.